ASIX: SIGMA2. SIGMA. Logic Analyzer. USB Logic Analyzer. UART Analyzer. I2C Analyzer. SPI Analyzer. SIGMA2 is a powerful, fast, flexible, user-friendly and cost effective logic analyzer with extraordinary large event memory, real-time hardware compression and complex trigger logic. SIGMA2 operates on a USB port and requires no external power supply. 256 Megabit SDRAM memory is used and further enhanced using a real-time hardware compression which allows for 14 680 064 sample storage or for more than 45 minutes of recording. Standard triggering options in the 8 inputs/100 MHz and 4 inputs/200 MHz modes - triggering on the input signal edge. Trigger point can be placed to any position of recorded events from the very beginning to the end. Ready for plugins - both ASIX and user definable, e.g. protocol analyzers (like I2C, SPI, UART, SDRAM, Full-Speed and Low-Speed USB, ...). Ready for easy multi-language support (not applicable for plugins). Waveforms can be saved and loaded to a computer hard disc. Waveforms can be exported to a text file for further processing. Waveforms can be printed on a printer. Flexible trace definition (any combination of input signals and constant logic levels) and trace representation (signals, buses - binary, octal, decimal, hexadecimal, ASCII). Input signal can be used in more than one trace. Free protocol analyzers: UART, I2C and SPI. USB protocol analyzer (Low-Speed and Full-Speed) can be purchased separately. Flexible control using mouse and keyboard. Personal computer requirements: Windows XP and higher, Pentium 750 MHz or faster CPU (dual-core processor recommended), at least 512 MB RAM (1 GB RAM recommended). Software also works under LINUX (using WINE). To illustrate the considerable capabilities of SIGMA2 and OMEGA logic analyzers we have prepared various examples of measured waveforms - USB, parallel bus (processor, display) and serial bus (I2C, JTAG, UART, SD card). Easy connection to PC - the comfortable USB interface. Low power - no power supply adaptor needed. Logic probe mode - SIGMA2 displays momentary logic levels on all 16 inputs. Detailed LED indication for instant and intuitive status checking. Fast operation - less than 1 second delay for any selected view. (Full data download takes about 90 seconds). Additional debugging features will be available by software upgrades and add-on modules. INSIDER - flexible monitoring/debugging tool for debugging MCUs and FPGAs (significantly enhanced replacement of discontinued product INSIDER). 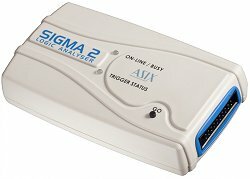 The SIGMA2 logic analyzer is available since December 2011 and it fully replaces the old SIGMA which has been on the market since 2007 and which has been discontinued in November 2011. In comparison to the older version, SIGMA2 features the same parameters for significantly lower price! SIGMA2: much less expensive - but it is not limited!